Lock in a great price for Ipanema Inn Hotel – rated 9.1 by recent guests! Staff were very friendly and efficient. They had staff members who spoke good English, and they were very organized they know your situation before you arrive. Any problems they sorted out quickly. The room was very nice. Some reviews on here called the rooms small but i didn't find that at all, altho9ugh bearing in mind I chose the 'Superior Room' option so I don't know about the others. The bathroom was excellent with the shower nice and powerful. They had spacious wardrobes, desks and WI-fi worked perfectly. Excellent location. The staff try very hard to make your stay as pleasant as posible. Breakfast and restaurant are excellent too. Joao Ramos was an absolute delight. Our front desk interaction with him could not have been better. His knowledge, friendliness and command of English was excellent. This small bitique hotel is a gem. We highly recommend it. Wonderful place. Staff are the best, rooms are wonderful, and the food us superb! Great location too, and the social and ecological awareness show in everything. Loved it truly! And highly recommend for anyone on tourism or business. Again, can't stress enough the marvelous food!!!! Enjoy! Amazing location and vibe. This exceeded expectations. The room description described city views, but if you opened the windows and looked to the right you could see the ocean! Amazing! Free breakfast; 1/2 price on drinks during happy hour; chairs and towel provided for beach; location of hotel was less than five minute walk from the beach. Hotel located in a pedestrian friendly neighborhood with lots of shops, restaurants and bars. Excellent breakfast, very good staff and great location. Ipanema Inn Hotel This rating is a reflection of how the property compares to the industry standard when it comes to price, facilities and services available. It's based on a self-evaluation by the property. Use this rating to help choose your stay! One of our top picks in Rio de Janeiro.This hotel has an unbeatable location only 450 feet from trendy Ipanema Beach, and 600 feet from Nossa Senhora da Paz Train Station. It offers car rental, WiFi and room service. All rooms at Ipanema Inn offer air conditioning, cable TV and a mini-bar. A breakfast with croissants, natural juices and fresh cakes is served daily, and may be requested in room. The restaurant and bar serves regional specialties and exotic caipirinhas. Copacabana Fort is 1.4 mi from the Ipanema Inn Hotel while Lagoa Stadium is 2.1 mi away. Santos Dumont Airport is at a distance of 8.5 mi, while Galeão International Airport is 17 mi away. 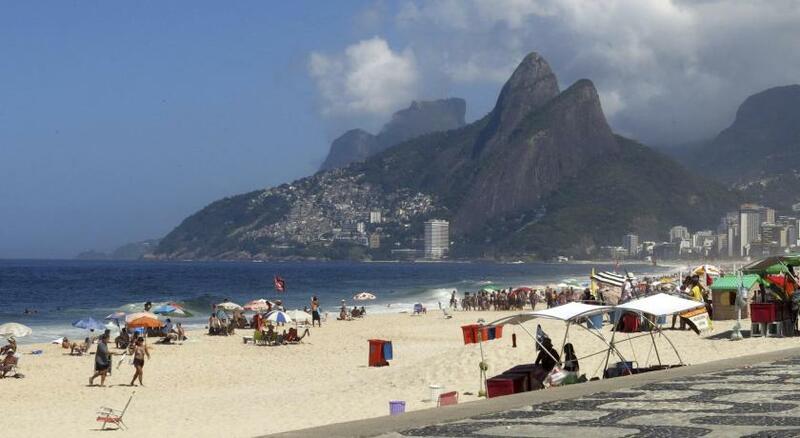 Ipanema is a great choice for travelers interested in beaches, sandy beaches and beach walks. This property also has one of the top-rated locations in Rio de Janeiro! Guests are happier about it compared to other properties in the area. When would you like to stay at Ipanema Inn Hotel? This air-conditioned room features a TV, mini-bar and a bathroom with free toiletries. With internal views, this air-conditioned room features a TV, mini-bar and a bathroom with free toiletries. Please note that this room category cannot accommodate an extra bed or a child's crib. This spacious duplex suite features a private balcony with a scenic beach view, 2 LCD TVs, 2 bathrooms and a dining area. Hotel surroundings – This neighborhood is a great choice for travelers interested in beaches, sandy beaches and beach walks – Check location Excellent location – show map Guests loved walking around the neighborhood! House Rules Ipanema Inn Hotel takes special requests – add in the next step! Ipanema Inn Hotel accepts these cards and reserves the right to temporarily hold an amount prior to arrival. Please note, only Superior Rooms accommodate an extra bed or a child's crib. Art. 82. The lodging of a child or adolescent in a hotel, motel, boarding house or similar establishment is prohibited, unless authorized or accompanied by parents or guardians (Law No. 0869 of July 13, 1990 - STATUS OF CHILDREN AND ADOLESCENTS ). If both or one of the parents are absent and are not staying with the minor, it is necessary to submit authorization for lodging done in person and signed by both parents or by the parent who is absent. This document must be notarized at the time of check-in. If the person who is accompanied by a minor does not have the authorization for lodging, he or she should go to the Juvenile Court. Please contact the hotel for more information. Room is small. Mattresses are soft - not good for the back. (Although the staff brought new mattress in with extra layers, but despite their effort, you still have the feeling to sink in - which is not great for the back). Small elevators scare me, especially as I couldn't see a stair option apart from the fire escape. Walls were a bit thin. There was a randy couple next door who sometimes kept me up. The only thing I can think of is that there was no roof view for all! Ah plus the eggs at the breakfast were not salty, but I could add for myself. The friendliest staff, great breakfast and supply of beach equipment (towels, umbrellas and chairs). Very close to the beach and some nice restaurants. Metro 4 minutes walk. Great place!!! Small room. Hotel restaurant wasn't great. Shower stall has large area of mold on the wall and floor. Because of Carnival it was a little bit overpriced, but ok.
Staff was very friendly. They offered me right away a tea when I arrived. Room was nice and clean. Breakfast was ok. Location is great.